US Road Trip Day 8 – Fire and Water | Where's my backpack? I woke up early; yesterday’s turmoil a distant memory and a new day full of promise ahead. The motel we had found, getting into Erie so late the night before, was grubby at best, and that was being generous. I decided against a morning shower, as it would have meant certain death for the three massive spiders roaming the bottom of my bathtub; the diaphanous web of mold spreading across the tiled surfaces might have suffered collateral damage also. Instead, I ran a comb through my hair, brushed my teeth, threw everything back in my overnight bag and was ready to leave within five minutes. My friend obviously felt the same way, answering my knock on her door with a fully packed case and Sprocket at her side. The previous night’s long drive had put us ahead of schedule, so today we decided to take advantage of the extra time. We weren’t far from Buffalo, and from there it was just a short hop over the border to see Niagara Falls from the Canadian side. At a drive-through coffee shop we fumbled in our cases for our passports and then ventured north. 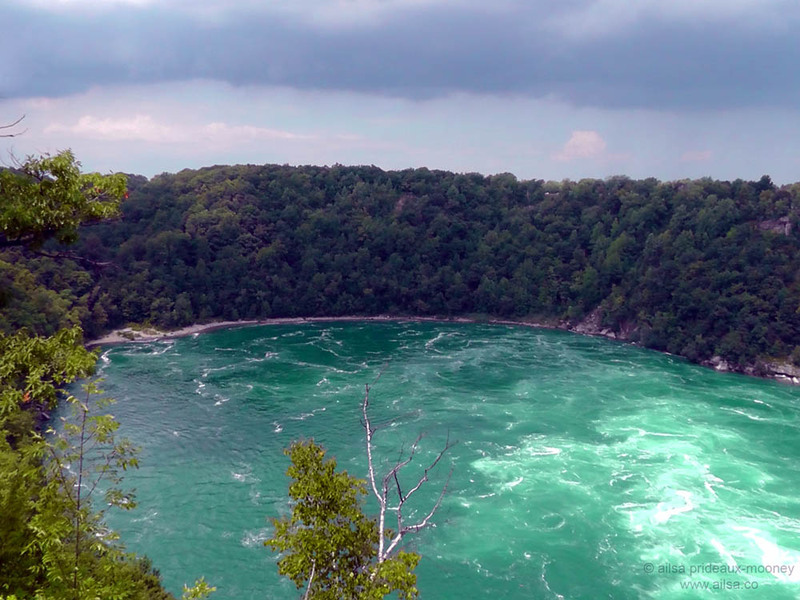 I proved a remarkably unworthy navigator, but my friend wisely ignored every direction I gave and soon we were answering questions for a very courteous border control guard and cruising towards Niagara, stopping first to marvel at the roar of the Niagara Whirlpool. Listening to the thunder of water and watching the cable car scurry back and forth across the Whirlpool’s grinding maelstrom, it was easy to imagine how this vast pool was formed in perhaps a matter of days when the rapidly receding falls hit an ancient sediment-filled valley and the tumultuous waters ripped it asunder. It was ridiculously busy so we parked quite a long way from the downtown area and walked along the Niagara river towards the waterfalls. I was mesmerised by the colour of the water; for some reason I had not expected it to be so vibrant. There was a haze in the air which diffused the daylight and the water seemed to almost glow emerald green. The crowds grew ever thicker and the mist thrown up by the cascading water formed little beads on my face and hair. There are three parts to Niagara Falls; the American Falls, otherwise known as the Rainbow Falls; a smaller waterfall next to it, romantically named the Bridal Veil Falls; and the Canadian Falls, often referred to as Horseshoe Falls. At one point in time, there was just one continuous waterfall, but the pounding water carved away the rocks beneath it until it hit an obstacle that caused the river to split in two. That obstacle was a particularly stubborn chunk of rock that refused to be eroded at the same rate as the surrounding rock, and today it is called Goat Island, after an unfortunate herd of goats who froze to death during a harsh winter on the island. To the left, Rainbow Falls and next to it, Bridal Veil Falls. Over to the right, the dramatic Horseshoe Falls. Goat Island is the rocky outcrop between the waterfalls. The crowds were beginning to get a little overwhelming. Glancing over at the Rainbow Falls, I saw things weren’t much better on the American side. Yellow-ponchoed visitors swarmed like drenched honeybees up and down the wooden steps that spanned the mossy green rocks. We waited patiently while mobs pushed by, and I took the opportunity to get a quick shot of Sprocket in front of Rainbow Falls. He looked a little frazzled; actually, we all did. Eventually, we reached the end of the walkway and had a chance to feel and hear the power of Horseshoe Falls. When I think of Niagara Falls, this is the waterfall I see in my mind’s eye; the graceful curve of water falling like a curtain. It is truly beautiful to behold up close and personal, and the negative ions released by the crashing torrents really did have a feel-good effect. For a moment, I forgot all about the hustle and bustle around me as I watched the dark river turn a translucent green just at the point where it starts to tumble down. Sprocket was more than ready to leave the throng behind, so we started back to the car, but Niagara had a little farewell present for us. As we looked towards Rainbow Bridge, which we were about to traverse back into the US, the sun came out and the faintest glimmer of rainbow danced across the river. It was an excellent goodbye. A friend of mine from Germany had read about another waterfall in the area, much smaller but with quite an unusual feature. When she heard I was in the area, she emailed me, so we decided we would try to find it and send her a photo. Eternal Flame Falls is located just south of Buffalo, which meant we were backtracking a little, but it was still early in the day and we had plenty of time. It didn’t take us long to find Chestnut Ridge Park and we drove to the south end as it seemed to be closest to the waterfall we were looking for. 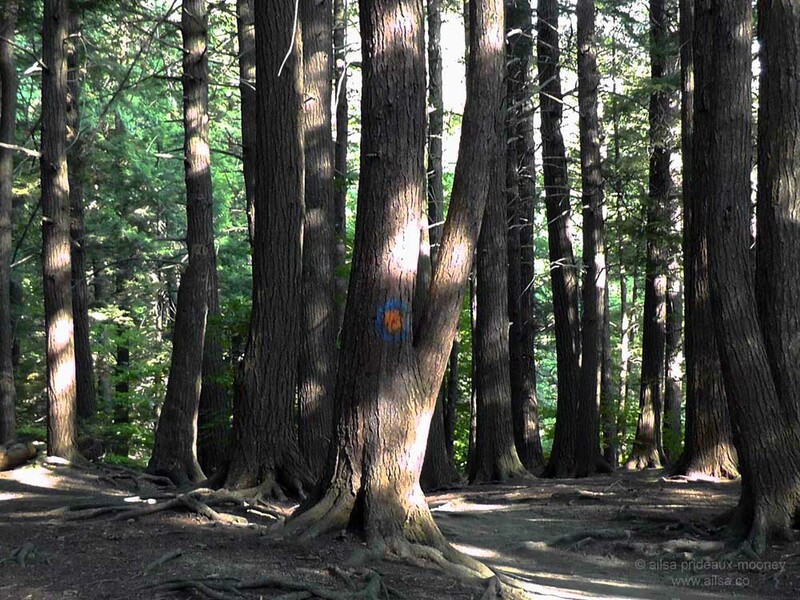 Geographically, it was closer, but we couldn’t access the trail from the south, so we hiked along pine needle covered pathways through thick forest until finally, we found a sign that we were on the right path. 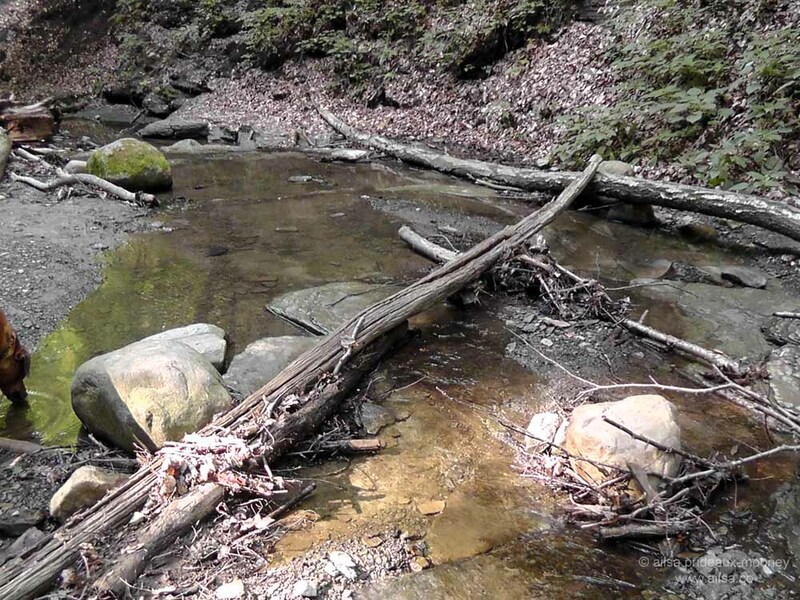 The trail was heavenly; winding down to a shady glen, at the bottom of which lay a river bed, just a trickle in the height of summer. We followed the glen upriver, clambering over rocks that basked in the sunlight filtered green by the overhead canopy of trees. 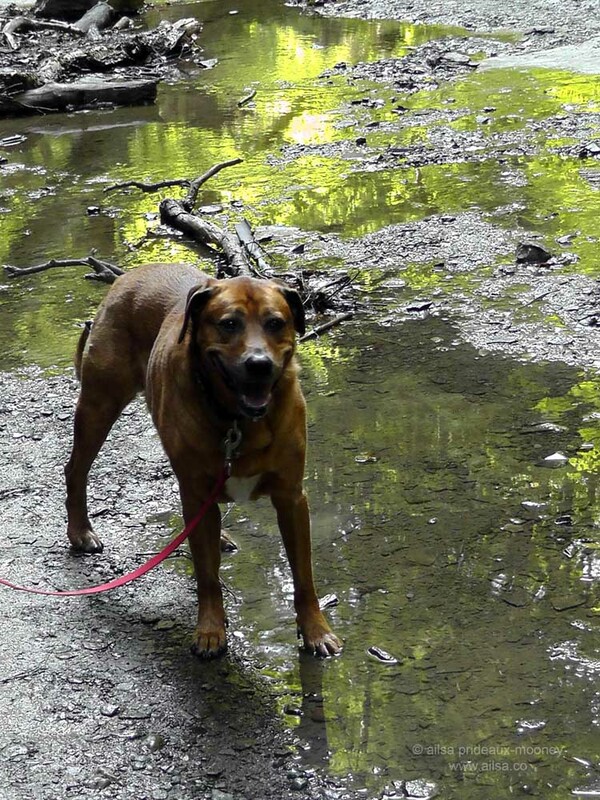 Sprocket was in doggy heaven; the occasional hiker passed by in the opposite direction but for the most part, we were on our own. As we rounded the final bend, I saw a towering rock face with a flicker of flames dancing in a little recess; water tinkling in little rivulets in front of the flames. With dark rocks soaring on three sides enclosing the space, this place felt for all the world like a temple made by nature; the atmosphere bore an uncanny similarity to that of an old and primitive church. Spirits renewed, we left the sanctuary of the waterfall and ambled back along the river, up the winding trail to our car. It had been the perfect antidote to Niagara. 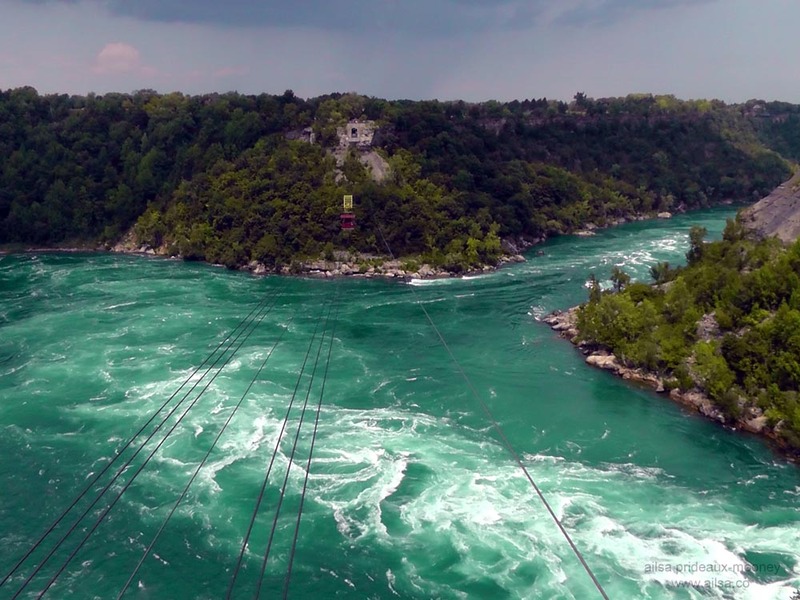 Although the power and majesty of Niagara is indisputable, the unrelenting multitude of tourists had been wearying and I had left feeling oddly deflated. 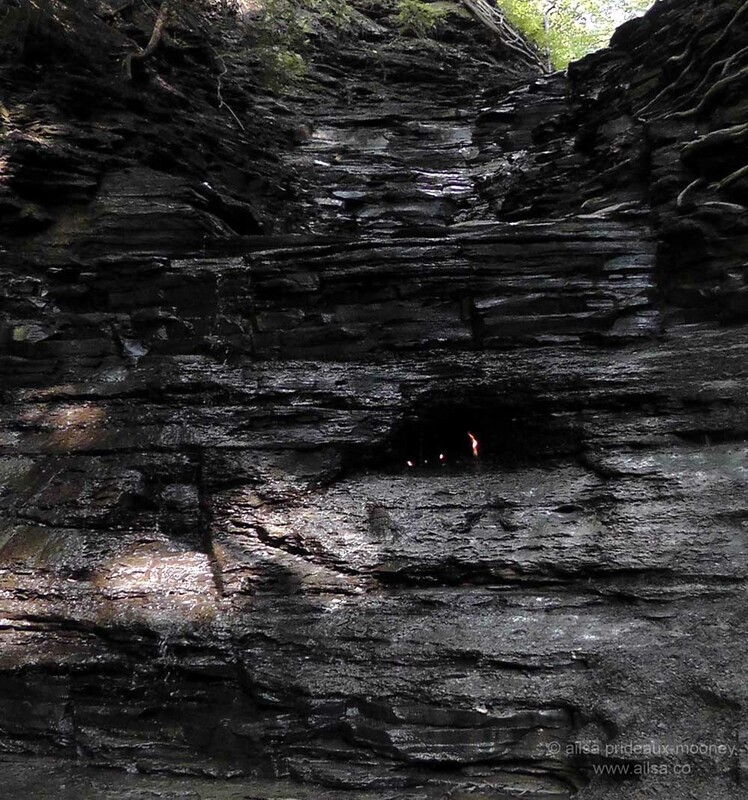 Eternal Flame Falls, on the other hand, had turned out to be everything I had expected, and more. Sprocket also gave it two (unopposable) thumbs up. Back on I-90 we drove east across New York state; through Rochester, home to the prominent suffragette Susan B. Anthony; through Syracuse, where Susan B. made her first public speech for women’s rights. We stopped shortly thereafter for the night, in a small town called Oneida. It was a respectably early night by our standards; we were able to relax over dinner and sprawl on the sofa watching television for a few hours before turning in. All in all, it had been a pretty perfect day. Here’s a little footage I took of the mighty Niagara Falls and the enchanting Eternal Flames Falls in action. 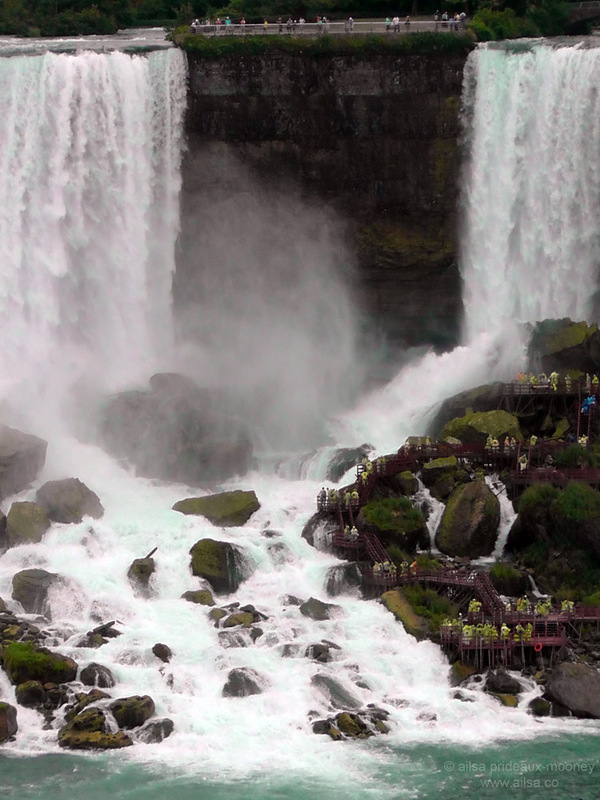 This entry was posted in Canada, New York, Photography, Travel, United States and tagged nature, new york, niagara falls, photography, photos, pictures, travel, writing. Bookmark the permalink. Those are beautiful pictures of the Niagara Falls area. It’s been many years since I’ve seen them in person. Thanks for sharing them. I’ve been wanting to see the falls for ages, Dawn. I lived in Manhattan for a couple of years but never managed to get up to see them while I was there, so it was thrilling to finally be able to visit. It’s a gorgeous area. Home sweet home. Thanks for this lovely reminder. stunning photos.. love to visit it someday..
Great post! Between the photos and the evocative descriptions it’s almost like we are there too! I was mesmerized by your story as I have been to Nigara Falls and found it to be an incredible experience. There is something about the edge of the falls that deeply moves my spirit. It wasn’t crowded when I went because it was chilly February. 🙂 The hike at the other park looked fun too. went there in 2007, had to stay on the American side which is a dump of a town as the border guards couldn’t guarantee they would let us back through even though we have UK passports and don’t need a visa. the US side of the falls is apparently better than the Canadian side but the Canadian side has a better town. Beautiful post. Your prose drew me in as well as the stunning photos. Beautiful post and what a stunning photos! These of the waterfalls are just breathtaking! No, unfortunately not. Was too busy with studying the last years and have a lack of money this year. Next year have to study again, so I have no idea when I can finally follow this dream to travell the world.. Thanks bulldogsturf, the roar was almost deafening right next to Horseshoe Falls, and also by the Whirlpool. It actually completely drowned out all of the other ambient noise. Beautiful images of one of my all-time favorite locations – tho I have not been there in many years, I love that area. Thanks for sharing your view of its beauty. And thanks for visiting and liking my weekly photo challenge – dogs blog! Absolutely beautiful! Thank you for letting me tag along. And thank you, Carol, for keeping me company along the way! I so get the feeling of ennui that you described at Niagra! I drove 3 hours just to see it and left wondering why everyone raves so much, but it is pretty amazing, just horribly busy. I loved the green in the photo of the top, jewel like. I don’t want you guys to reach your destination…I’ve so enjoyed taking this road trip with you! They probably don’t have a raincoat in Sprocket’s size! I watched the boats sailing out towards the falls and wondered how anyone could hope to remain dry. My hair was soaked just walking along at street level, I imagine it would be like standing in a shower on the boat! They supply you with raincoats, but you still get pretty soaked. We’ve had Niagara in our apparently tentative plans for a couple years now, and you’ve whetted (or wetted?) my appetite to get there. I have to say, though, that I’m now way more interested in Eternal Flame Falls – you made that side trip sound much more appealing. Enjoy your adventure! Excellent post, Ailsa. The Niagara Falls is truly majestic, and incredibly powerful as long as you can get past that crowd. It’s been 2 years since I last went, and I’m hoping to go there again next summer for some photographs. 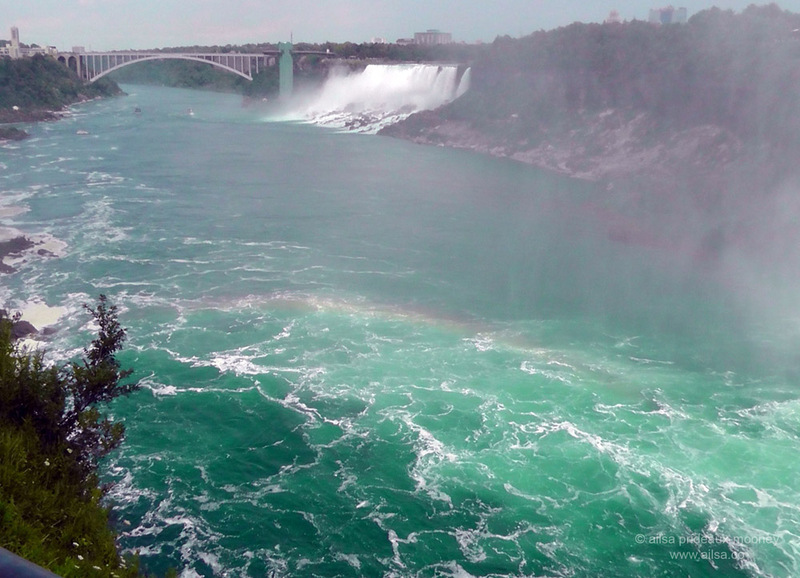 Your photos of Niagara remind me of my visit there. And, recently I read a book about a lady that went over the falls in a barrel. Ooh, Mary, I haven’t heard of this book but I have heard the story – and standing at the edge of the falls you can’t help but wonder what would possess anyone to attempt a barrel drop over the falls. I actually thought about her as I stood looking at the sheets of water powering over the precipice. Insane! Next road trip needs to include the Calgary area. I’ll take you up the mountains to see some awesome turquoise glacier fed lakes. They always seem to glow when it’s cloudy out. Love your photos. Yesss! Photos, I am soo there. If I get to the Calgary area I am looking you up and we are hitting the lakes, they sound amazing! Waterton Lakes isn’t as turquoise, but the surrounding scenery is stunning too. We can have an amazing itinerary! 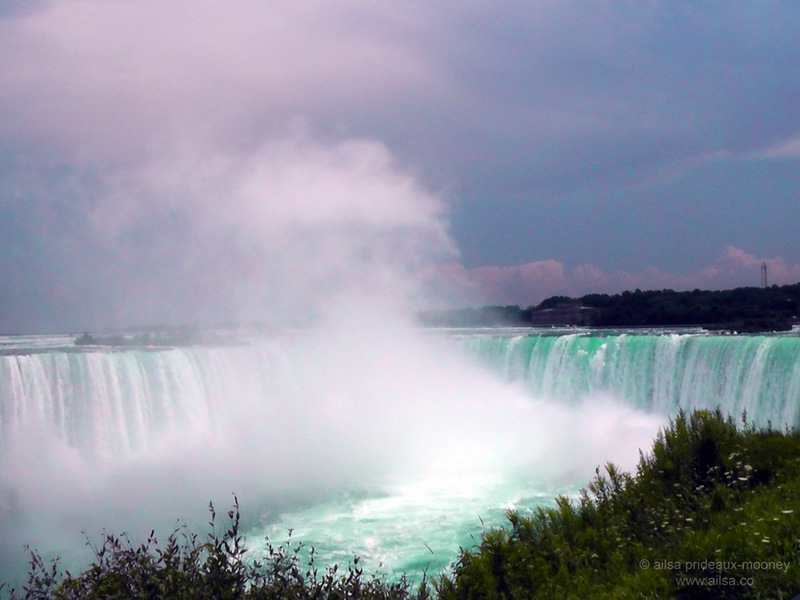 I’ve never been to Niagara Falls but I don’t mind – I’ve enjoyed them in this post instead. Your writing is brilliant, Ailsa. If I had to pick a favourite photo, it would be the one of the edge, the first moment of the fall, that green that I can’t describe. You show the US to be an amazing country for natural beauty, something I completely missed when I was there. Oh Trish, these last few weeks on the road have blown my mind. I’ve always wanted to do the all-American road trip, but never in my wildest imagination did I expect it to be so spectacular. I am in love with life on the road, I don’t want it to stop. There’s always something fun to do in the big cities, but it’s the places in between that make me want to keep going. Forever! Perhaps your future has a place for a train trip across Australia and a road trip back. Beautiful photos. I had no idea the water could be that lovely shade of green. I was surprised to see the cable car; I’d heard that it had been removed. That was my one vivid memory of being there when I was a kid. My dad took my sister and me across in the cable car (mom wouldn’t go 🙂 ) I haven’t seen it since, but your post makes me want to go back. I’d like to go on the eternal flame hike, too. Fascinating. As Karen Purcell above says, I don’t want you guys to reach your destination b/c your recounting of this trip is so entertaining. Yay! Still photos are great, but when you can hear the roar and see it moving, Niagra Falls comes alive for those of us who aren’t there in person. Same for the eternal flame (with drips instead of a roar). Your posts are delightful, and the video is the icing on the cake. Stunning pictures of Niagara Falls. I loved it there growing up! What a great collection of photos with your accompanying writings. I visited the falls long ago and loved viewing them, particularly from the Canadian side. Took the Maid of the Mist boat trip and seeing your post brought it all back to me again. Happy memories revived! 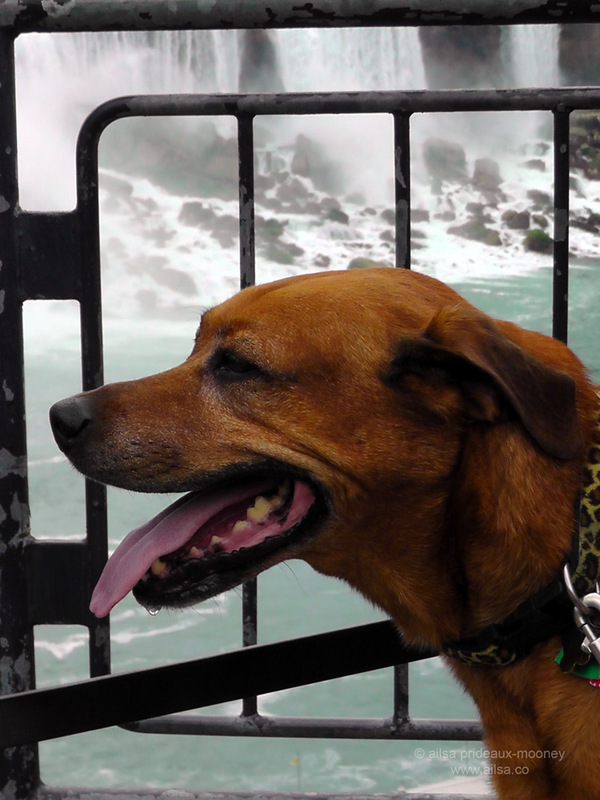 The photo of Sprocket at Niagara Falls is such a beautiful portrait! Fabulous post – like you, I cannot believe how green that water was – amazing. And, the Eternal Flame Falls?! – I must click on that link, very strange. I am now back in NZ – no cockroaches in sight. Hurrah for the lack of cockroaches, Pat. That ‘pack your own toilet paper’ suggestion had me laughing out loud! Beautiful images of Niagara there! It has been many years since I have seen them, and I had forgotten how big they were! They really are so powerful when you’re up close to them, Ali, it was amazing. These waterfalls are impressive ! It makes me think about the ones in Iguazu, that I visited in Argentina. Great photos ! Now there’s a place I long to visit, Karine, I’ve heard the Iguazu waterfall is spectacular. Amazing pictures of the falls! LOL – just saw your post now and realised we both posted photos of Niagara on the same day. How very weird and spooky 🙂 The falls were obviously calling my name. I visit the falls when I was in Toronto … amazing – how have you been able to get so close to the fall itself … as in your video. It was like you were standing on top of the fall, brilliant job and also the eternal flames. I missed that. I hope you drove by the smallest church in the world – only holds 2 people at it time as max – I would say one person. I love the mist in my face too … and I spent money on a helicopter flight over the fall, fantastic … even if I was scared. I was the only one on the tour that had booked the helicopter, but all of us took it as we came to the airfield. Because they had to wait for me until I was back from my flight before we took off for the falls. Had a really great day. Thanks for the video and the great photos. I was on a small bus tour from Toronto – I think we where 8 total and I was the only one that had booked the helicopter – so they took us to the air field first – and when everybody else heard what I was going to do .. they all booked a flight too. I was so scared … don’t like heights where I too close to the ground. And he was flying very low over the falls, fantastic when I came over my .. fear. 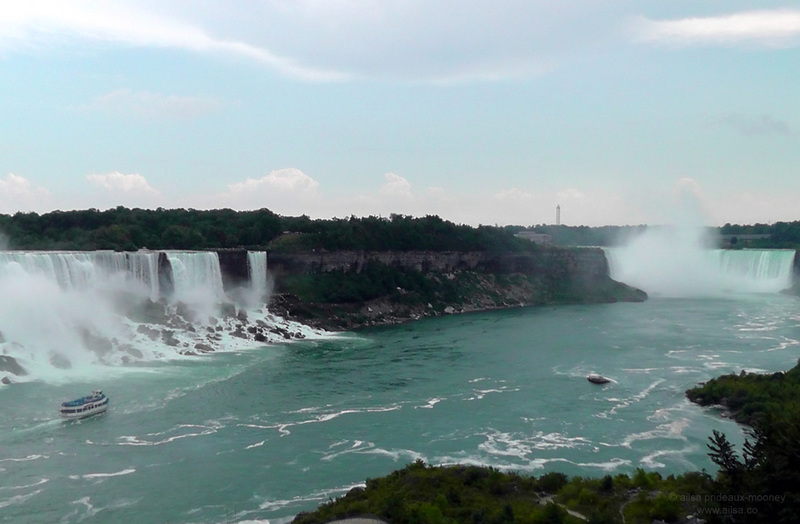 ….my partner and I traveled from CA to the east coast and back again this summer – also stopping at Niagara Falls so am enjoying what we missed from your blog. It’s too bad Niagara could not have been left more natural without all the commercialism around it. Another worthwhile visit is the National Women’s Historical Museum in Seneca, NY – where the first woman’s congress was held should you ever make it there. We just stumbled upon it. Right now we are in Chiang Mai, Thailand and adding photos from here. All the best….in peace…. Just getting caught up on comments, Kai – how was Thailand? Another amazing place I long to visit! I’ve never been to Niagra Falls, so thank you for the wonderful pics and explanations! 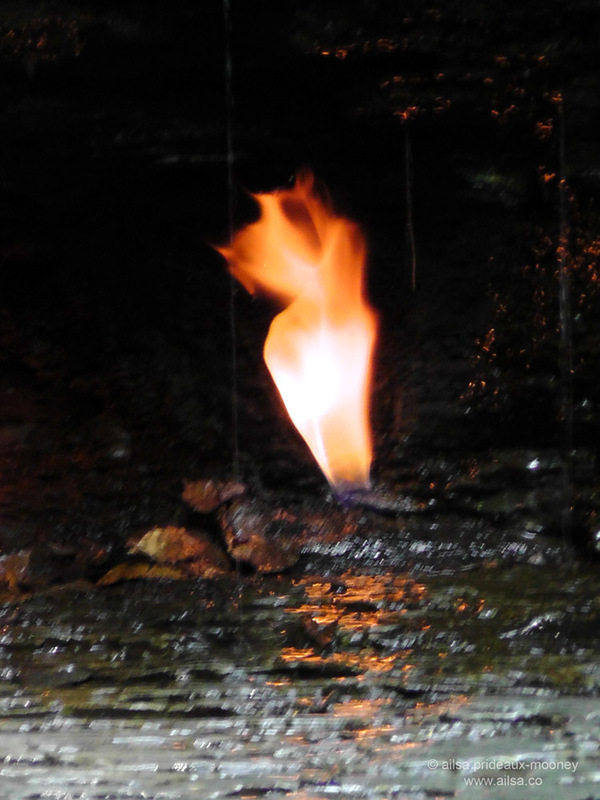 Also, the Eternal Flame Falls was fascinating, I’ll have to go read up on it. I’m so happy you stopped by my blog the other day – I would have never found you otherwise. My son, who adores travel and is currently in the Peace Corps in Nicaragua, will love following your blog! 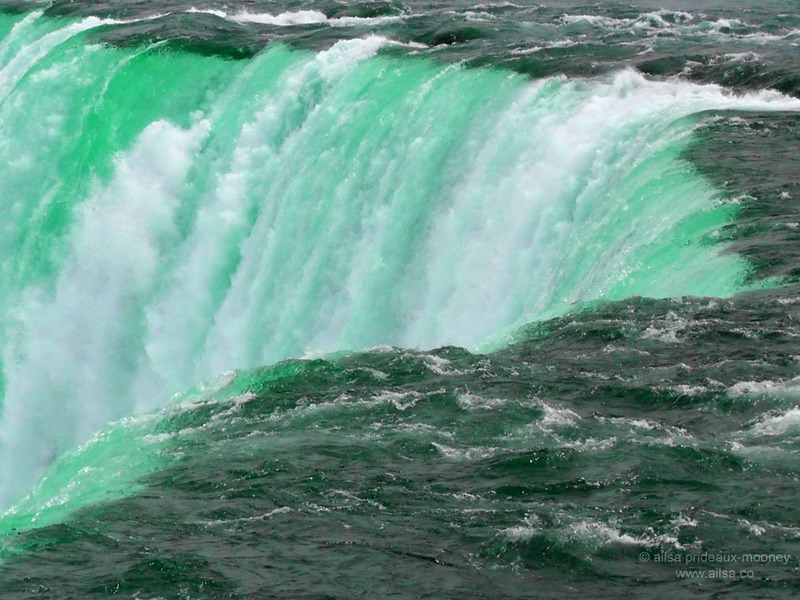 The water in some of the Niagra Falls shots is an amazing colour. I know, I really couldn’t believe how dazzlingly green it was, it was beautiful. What a journey you are having! Great shots of the Falls! Looking forward to going back one day. Hey Ailsa where’s day 9?! Great will make a cuppa and settle down for a good read! Thanks!